The video refers to a press conference on the development plans of the Presidential Library for 2018. 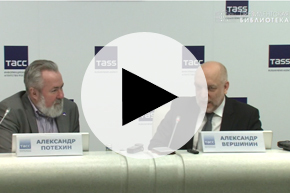 The press conference was held on February 27, 2017 in TASS (St. Petersburg) with the participation of Alexander Vershinin, Director General of the Presidential Library, who spoke about the key topics that the library will focus on in 2018. Among these topics are the election of the President of the Russian Federation, the jubilee dates of the Constitution and the World Cup. . I. Yarosh, Vladimir Mikhailovich. Ii. Yevseyev, Marina Igorevna. Iii. Ratnikova, Alla Vladimirovna. Iv. Khudyakova, Alexandra Sergeyevna. V. Stanyakin, Anatoly Petrovich. Vi. Presidential Library (St. Petersburg) .1. Presidential Library (St. Petersburg, city) - Multimedia publications. 2. Folk (collection).